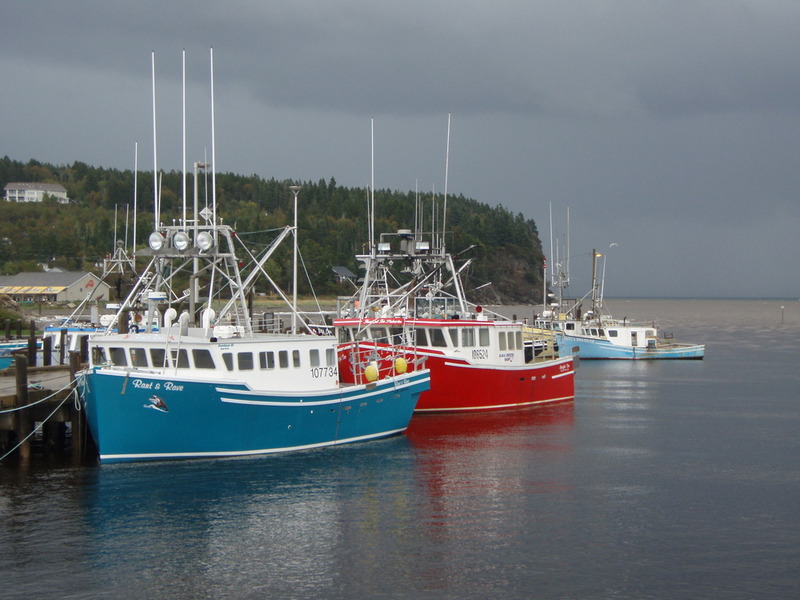 Back home and once more reviewing my Nova Scotia and New Brunswick photos, I think back and remember strikingly beautiful and clean Provinces . 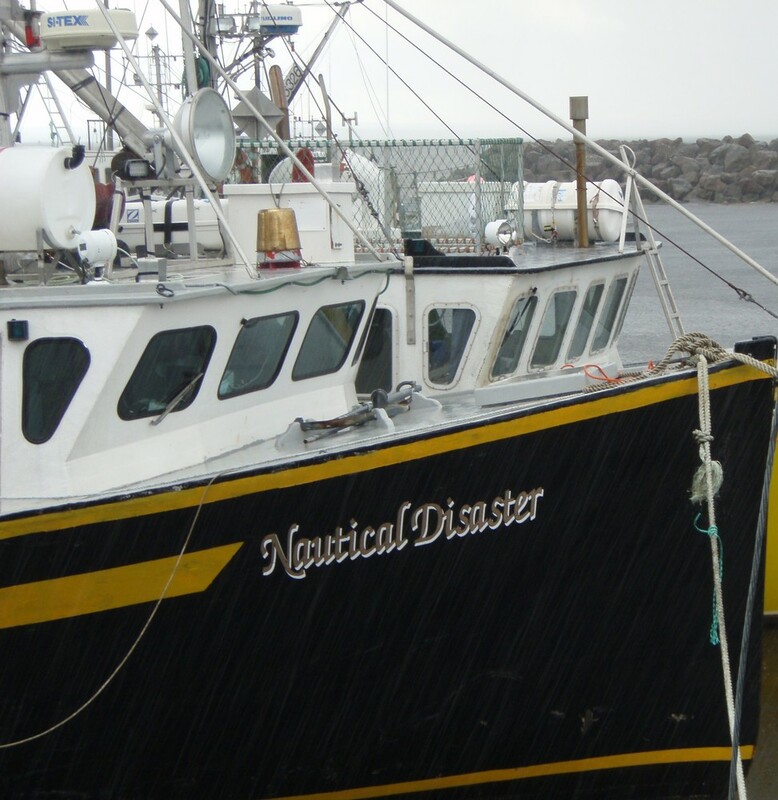 I recall friendly Maritime Canadians and wonderful Seafood Crowder. The vast acreage of untouched land has more trees than I have ever seen and a great many of them pine. It’s what you imagine an overgrown and out of control Christmas tree farm would look like. While taking a walk one day, it even smelled like Christmas trees. 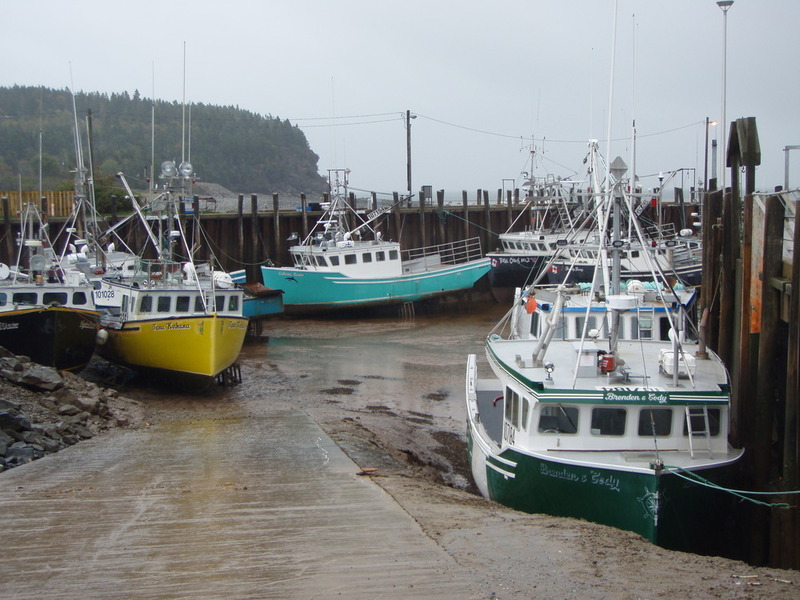 I loved all the water, the colorful boats, the stacks of lobster cages, the fishing villages that look like something in a movie set and the Bay of Fundy’s extreme tides. 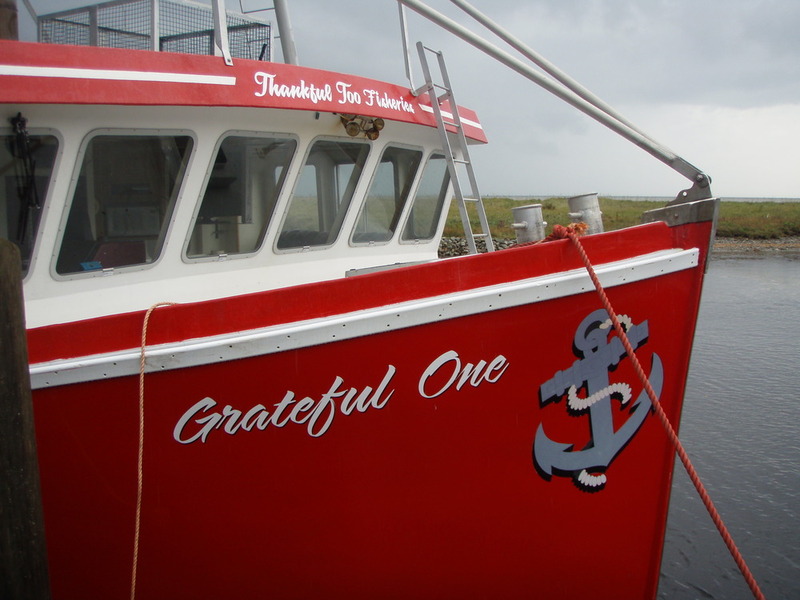 I could be content taking photos of the high and low tides and the boats that are victims to them everyday, given the chance. 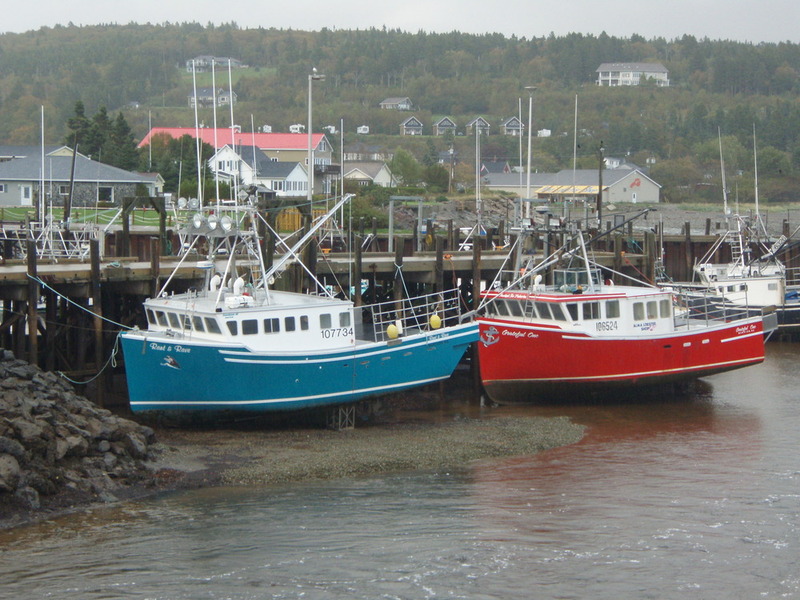 The Canadian Maritimes are a super place to have an adventure and explore and ten days doesn’t begin to even scratch the surface. 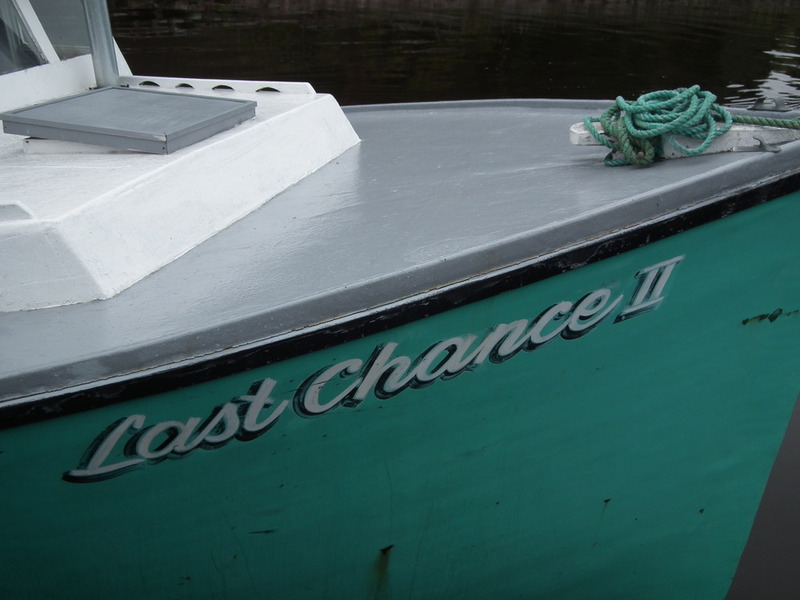 Hope you enjoy these last photos of my Canadian trip and let me introduce you to a few boats I met along the way…. leave out. 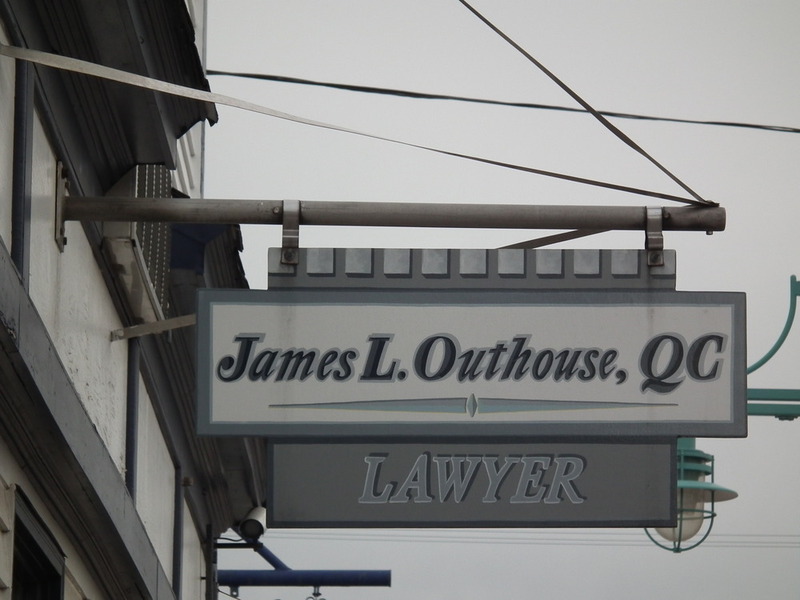 It really is the lawyers’s name! 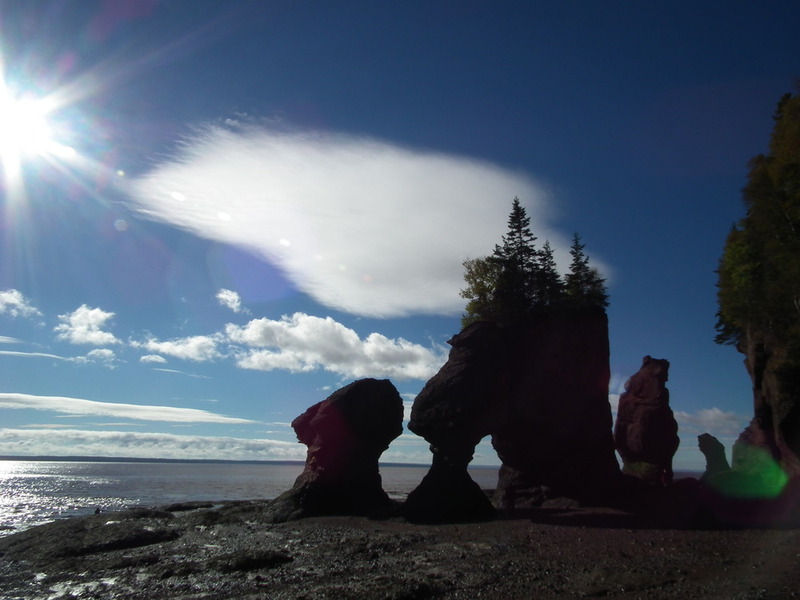 Last sightseeing day of the trip and we went to see the Hopewell Rocks in the town of Hopewell Cape, New Brunswick. 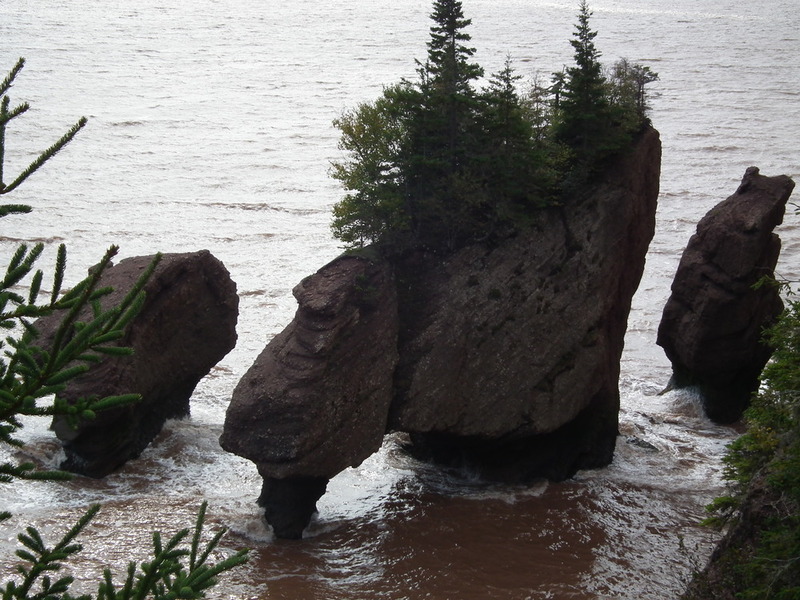 These sandstone rocks, that stand by themselves, are also affectionately referred to as Flower Pot Rocks . 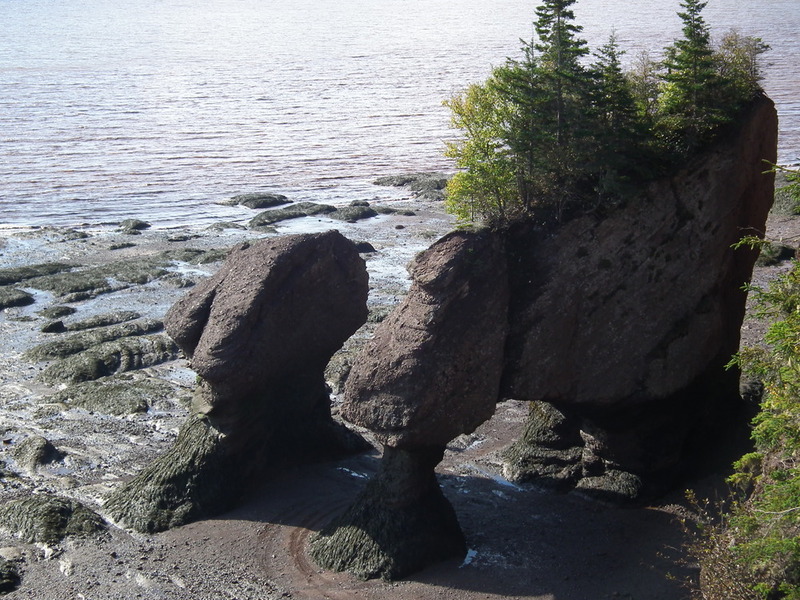 It is believed that the certuries’ force of the Fundy Tides has carved these rocks into their flower pot shape from the cliff and will continue to change them in the years to come. 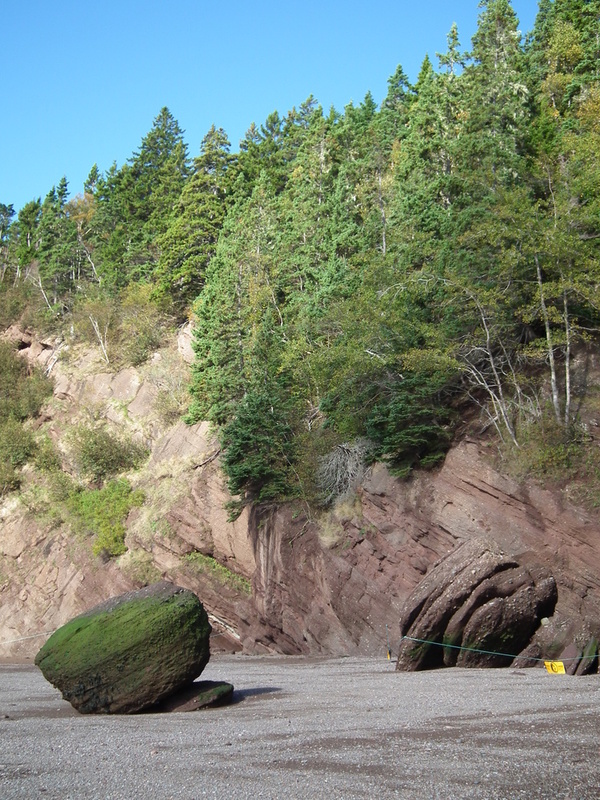 The Rocks and the ocean floor were interesting to see and the rocks were huge! I can’t even believe to tell you how huge they were. 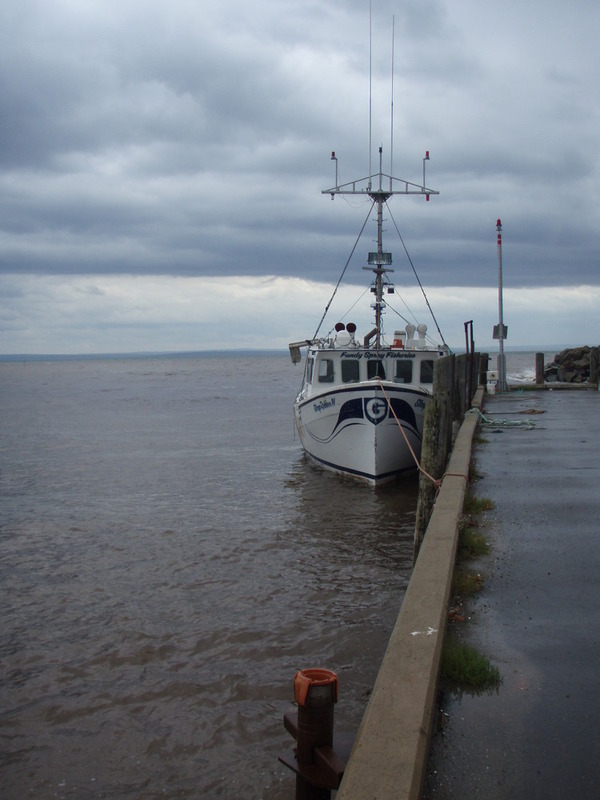 The high tide that day was 40 feet at Hopewell Rocks and low tide was 4ft. 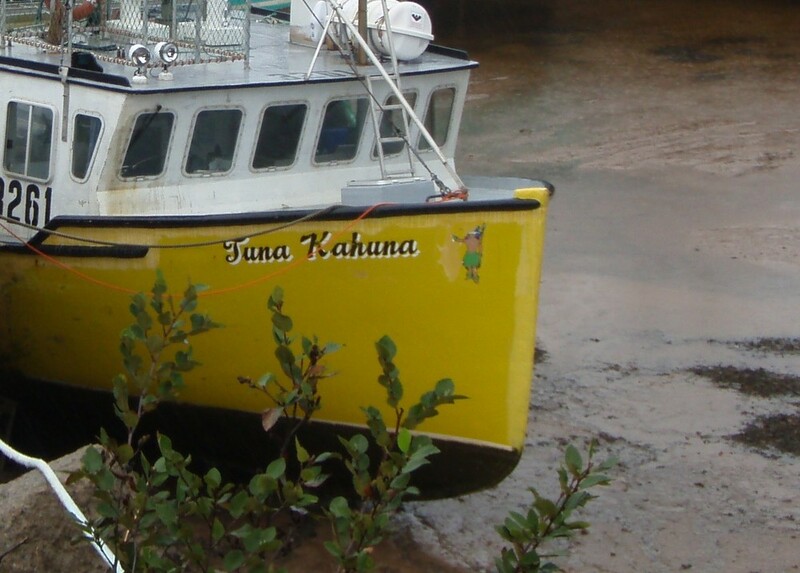 So, obviously, at high tide, you can only see the Rocks from the look out up top. Afterwards I went into their restaurant and had a wonderful piece of pumpkin pie. 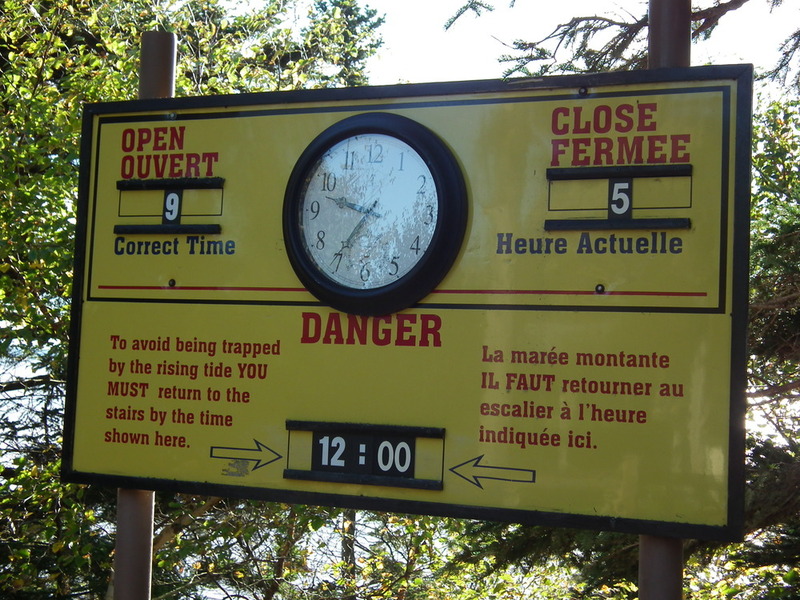 Then it was time to climb back in the car for the four hour trip back to Halifax for some last minute shopping and fly home . 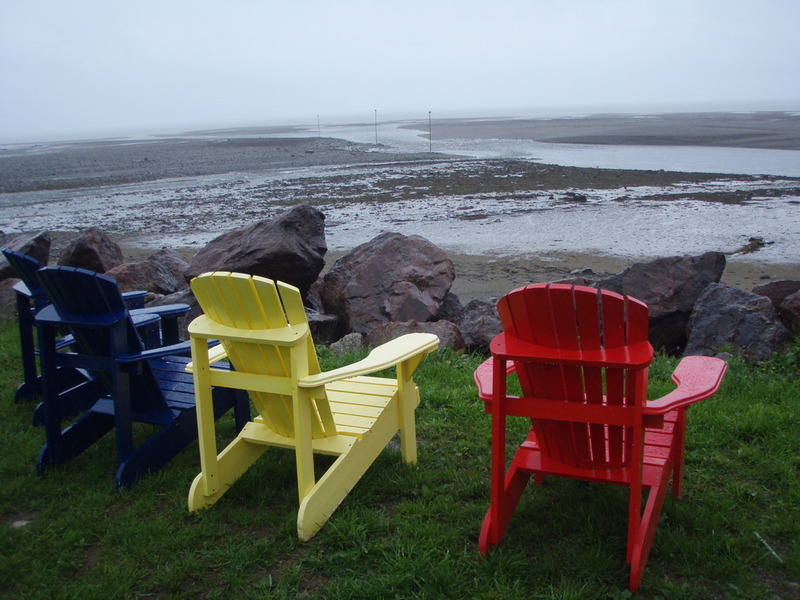 Thanks for traveling with us through Nova Scotia and New Brunswick! 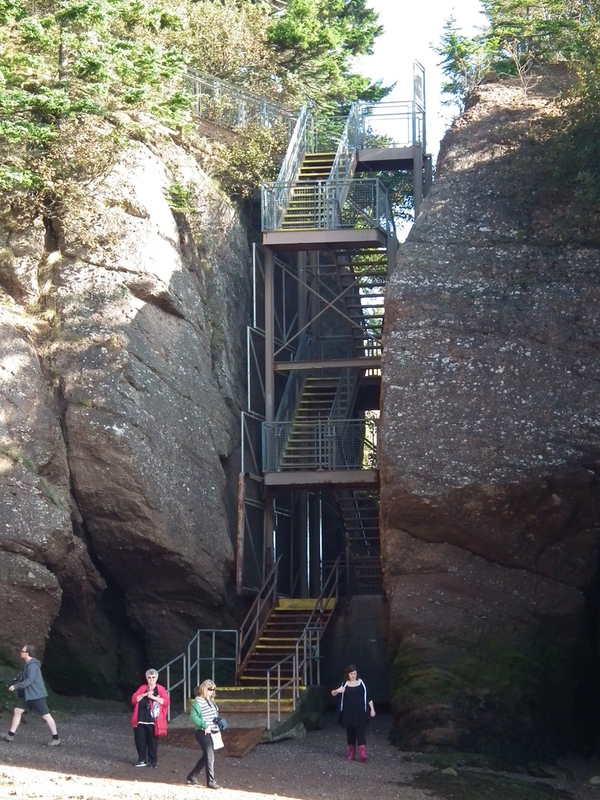 100 Stairs Down to Ocean Floor at Low Tide. 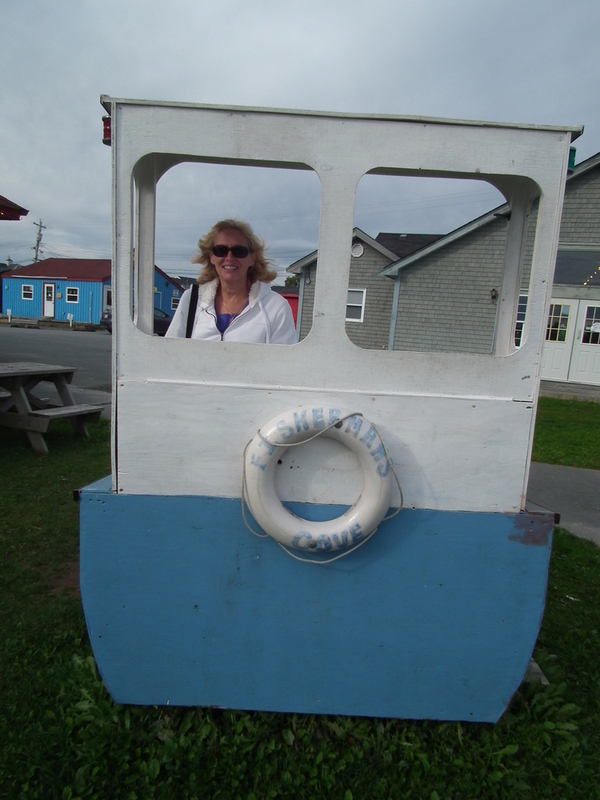 Alma, my last coastal village before going back to Halifax, just might be my personal favorite. 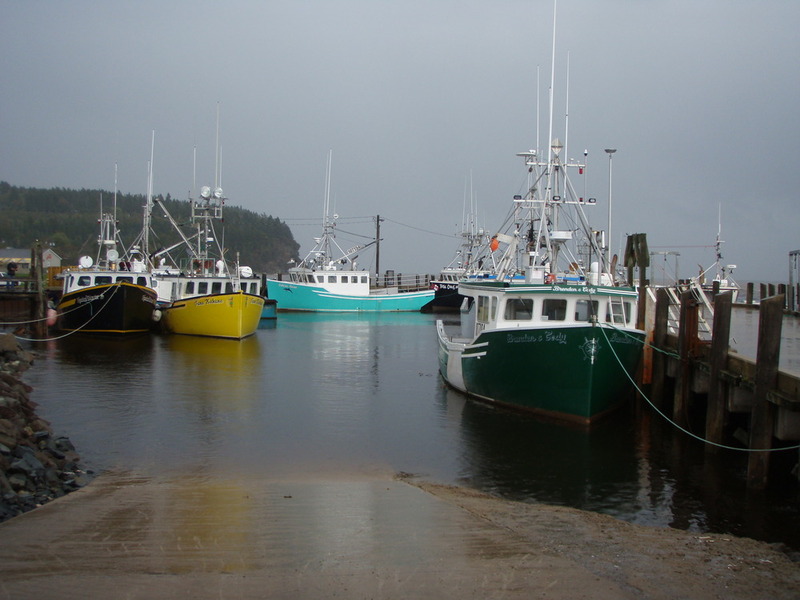 It’s a small village that sits outside of Fundy National Park. 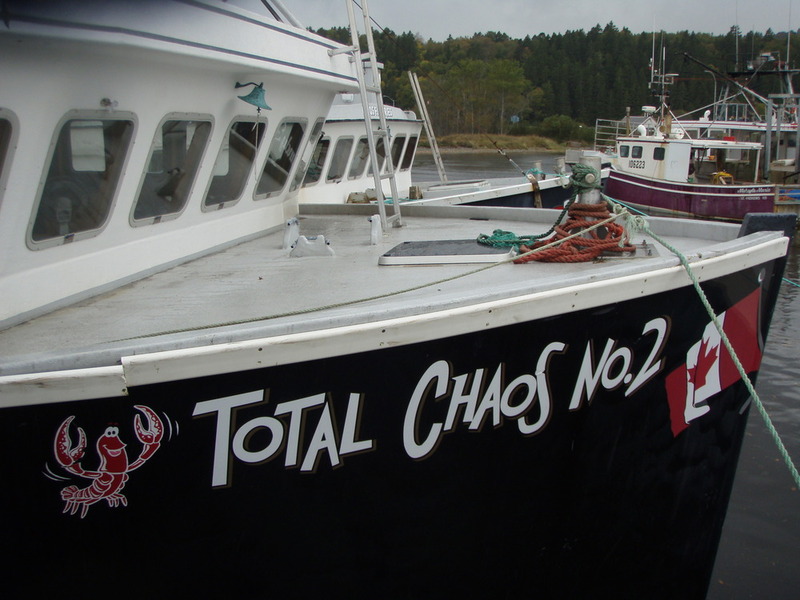 Alma’s Fundy extreme tides in the Harbor were incredible! 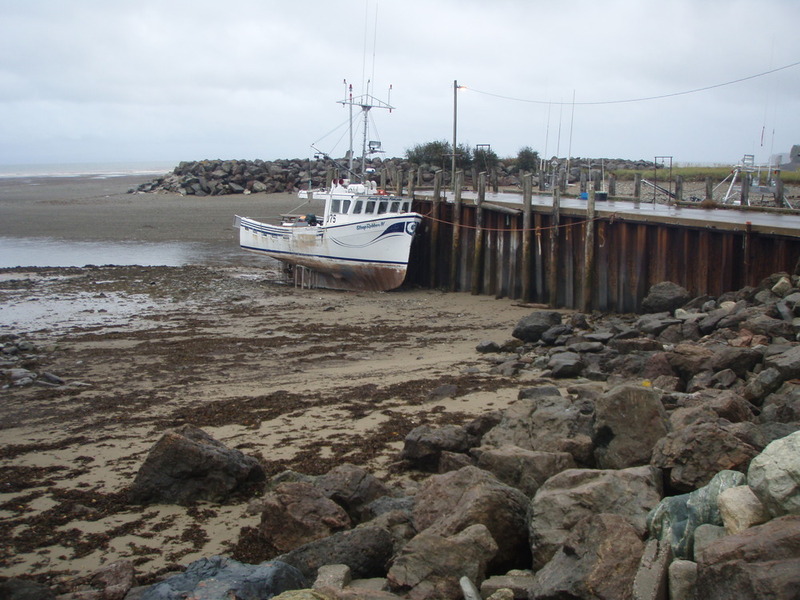 You’ll see which I mean from my photos taken at low tide, which was 2 feet, and then at high tide, which was 35 feet. 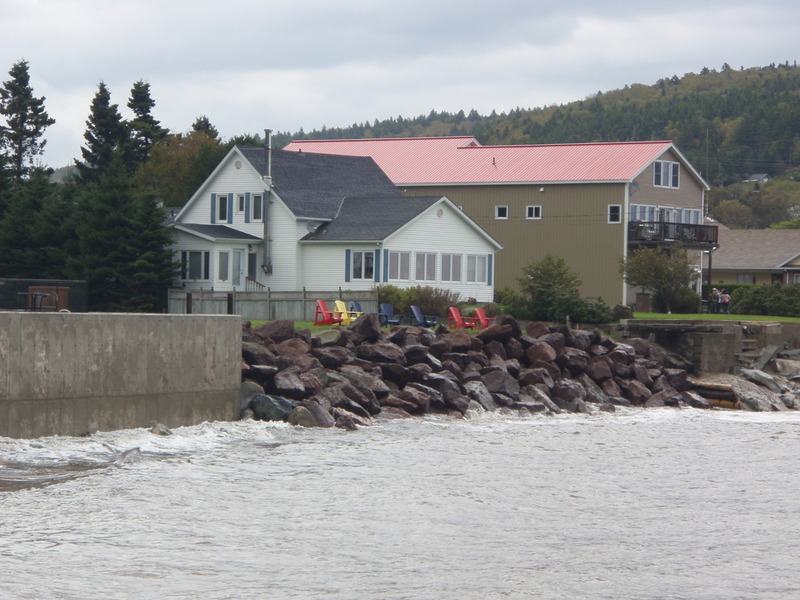 Besides taking photos of the harbor and walking the little town and the rocky beach at low tide, I also went to see Cape Enrage and Hopewell Rocks which are nearby. Cape Enrage is the tip of an island with jagged sea cliffs with an 1847 lighthouse, restaurant, gift shop and zipline at the top. 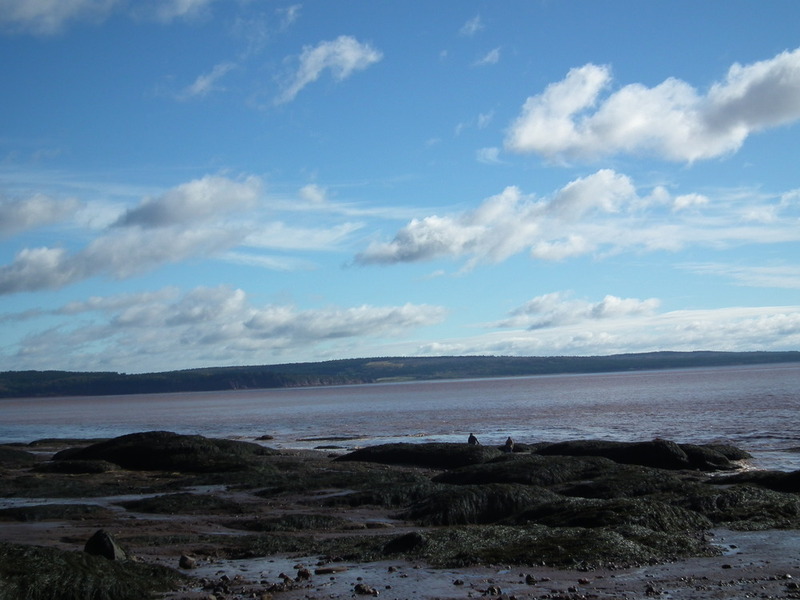 The bay water surrounding the tip is practically violent due to a buried reef, thus the name Cape Enrage. 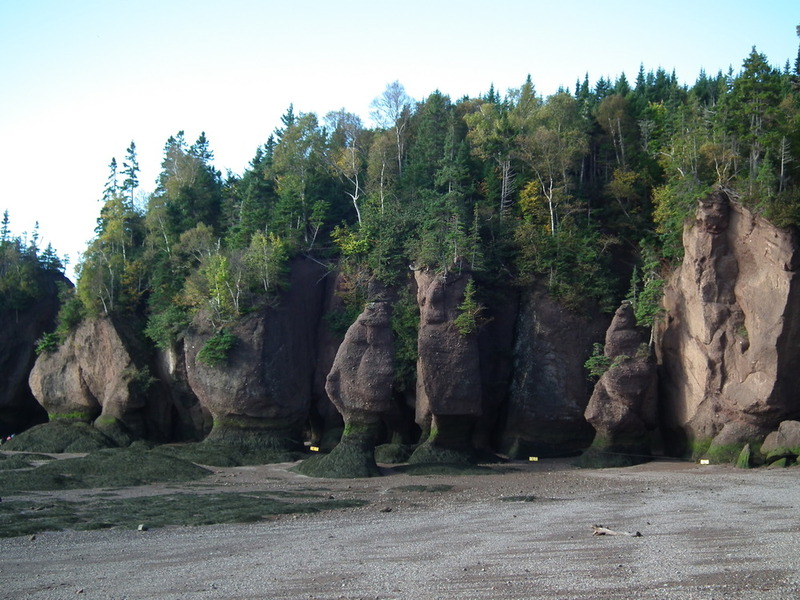 I also went to Hopewell Rocks but that blog will follow. 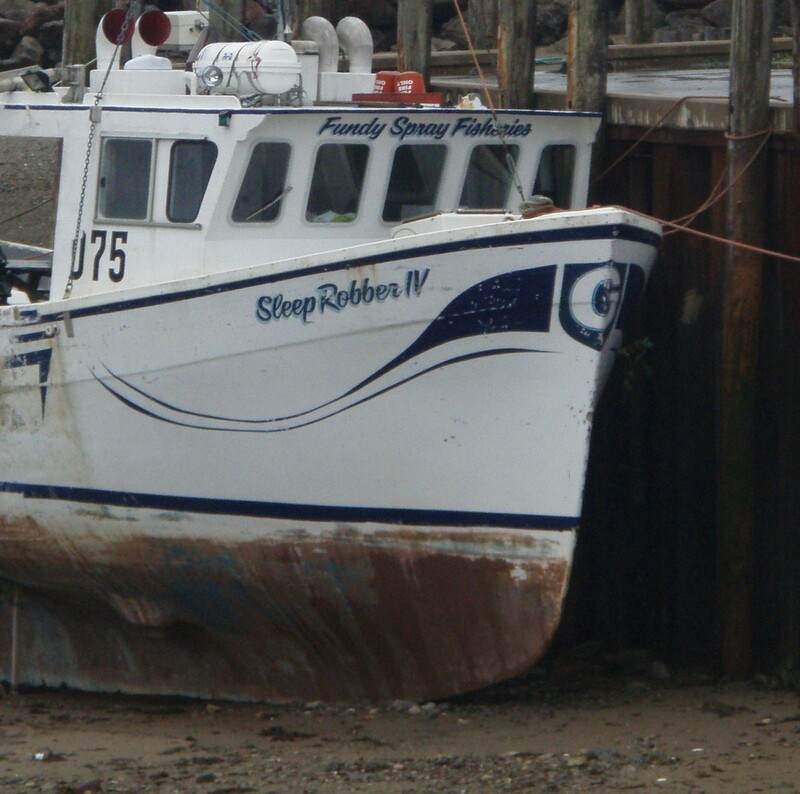 Enjoy the photos showing off Fundy’s extreme tides! 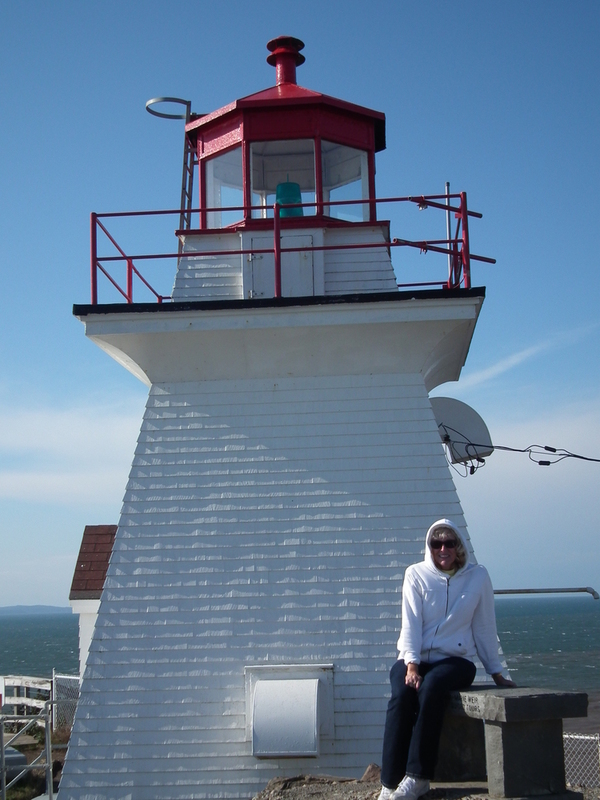 Me at Cape Enrage Lighthouse – VERY WINDY!